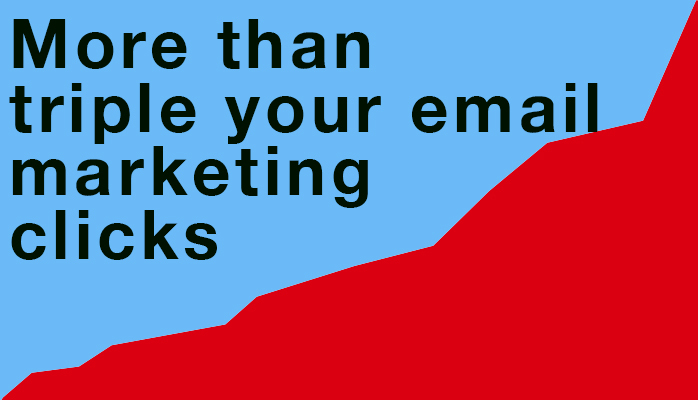 What’s going to get your email marketing emails noticed and acted upon? What’s going to get the most clicks to your website? The thing with email marketing is that it’s a ‘DISRUPTIVE’ marketing channel. That means that the recipients of your sales emails have not asked for you to send them an email. So, if you send them something that looks like you’re trying to sell to them, they’re more than likely going to ignore it. Think about your inbox and the emails you receive. Any email with lots of pictures, logos, coming from a ‘do not reply@…’ or ‘The marketing department’ email address, means one thing – we’re about to try and persuade you to buy something. But…if you’re selling an expensive product or service, or what we refer to as a ‘high value consultative sale’, then the email needs to work hard for you. It will be more successful if you pique the interest of the recipient with a clever subject line and informative, pertinent and interesting text. In a recent email test for a client we pitched a well-designed HTML email with nice graphic images, against a text only email to see which performed the best. Apart from the visual presentation, the email address used, subject line and content of the email was the same, with the same number of identical links in each. We split a pool of ‘warm’ email data 50:50 and sent to each of the lists at exactly the same time. The opens were 378 on text only vs 355 on HTML – similar due to having the same subject line. Text only email – 76.8% of the click-throughs. HTML email – 23.2% of the click-throughs. The deliverability was more successful with the text only email with fewer bounces, and the unsubscribe rate was 14% less. Many people believe an HTML version will win the day. However, as you can see above the text only email outperformed the HTML version by no small margin. So, what’s the best strategy for email marketing success? Like any marketing channel, the content needs to be right for the specific channel. Just like a poster on a main road needs to be very different to a radio ad, an email needs to be just right too. Well-targeted, with content relevant to the audience, and crucially, the content needs to be interesting! How many times have you seen emails bleating about how a company has a new website or Matt is the new head of sales. It’s just not going to cut the mustard! Keep your emails short, pertinent, helpful and to the point, sprinkle them with a few relevant links here and there to encourage engagement, and you’ll enjoy greater success rates with your email campaigns. Oh, and one more thing, remember it’s never about you, it’s about what the email recipients want!